Today was a perfect day for a trip out. This week has warmed up again, and it may well be the last warm spell before temperatures are due to drop next week. We say ‘drop’, but that means that the daytime temperature may be in the low 20s as opposed to the mid to high 20s. It’s a tough life. 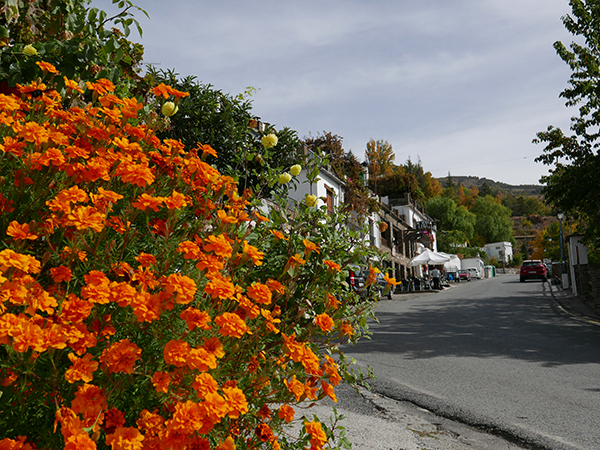 We decided to venture into the Alpujarras region on the southern slopes of the Sierra Nevada. We have had a funny relationship with the Alpujarras in the past, and this has undoubtedly been because we have not been to the right parts, as we discovered today. The last time we visited the area, I think we must have been either very hungry or possibly a little car sick (probably both!) as we grabbed a picnic (tomato, jamon, bread, queso) and must have just stumbled into the nearest village to the north of Órgiva. We ate the picnic on the roadside, plagued by wasps, and I believe it may well have been my birthday, but other than that, we can’t recall its being particularly memorable. We also have a slightly uneasy relationship with Órgiva, for no other reason that there has always been an all-pervading whiff of dodgy tobacco drifting around the man square, and hippies are still very much alive and kicking in this small town giving the place an unique character. We have, though, decided to revisit the place and uncover its undoubted charms, so more of that in the future. Today, we thought we’d drive up the Barranco de Poqueira and visit the three famous white villages of Pampaneira, Bubión and Capileira. This gorgeous valley lies in the Sierra Nevada National Park with Capileira sitting at the highest point along this route before you hit the high peaks of the mountain range. The drive from Órgiva is simply beautiful at this time of the year. The deciduous trees were all starting to change colour, the sky was a milky, pale blue and the mountains that surrounded us were muted pastels. Everywhere had a hazy, mellow, autumnal glow as the winding road climbed up the mountainside. I had felt convinced that we had travelled this road before, but as each bend provided new, breathtaking views, we, neither of us, could remember ever having been this impressed by this region before. We drove for about an hour from home before we arrived at the first of the three villages, and what a charming place Pampaneira turned out to be. Parking near the top of the village, we walked down delightful cobbled lanes past immaculate stone and white rendered village houses, all sporting chunky chestnut beams, slate roof tiles and bedecked with plants. The main village square might have been filled with visitors dropped off by a coach, but this did little to spoil its beauty. This is a confident village that exudes atmosphere; an atmosphere very redolent of mountain villages in other countries of Europe and very different to other parts of the Granada region. Shops sell the rugs for which La Alpujarra is famous, and we were more than happy to make a purchase - a very lovely piece that is thick and richly coloured, and for the princely sum of €28. We decided to press on up to Capileira for lunch, having enjoyed media mañana in the church square in Pampaneira, and driving through the very picturesque Bubión en route. Capileira is quite different in character; much smaller but no less pretty - whether the coaches of tourists bother to come up this far at this time of the year, I am not sure. Whatever the reason, it was siesta time, and most of the few shops and bars were closed, so it had a very sleepy, out-of-season feel to it. That said, the views from the various tiers of the village were incredible, and the scent of woodsmoke only served to accentuate the almost treacly richness of the colours around us. We settled on the terrace of a small bar just above the church, and ordered two beers, slightly concerned that tapas might not be de rigueur here. We had all but written of this particular hostelry when a plate of delicious paella was delivered, and our combined demeanours changed instantly (how fickle we are!). This place must be absolutely beautiful in winter, when snow lies on the Mulhacen peak - two wood-burning stoves inside the bar give an idea of how cosy the interior spaces would be when the temperatures plummet in hard winter. We determined to return in January. We started the drive back with a drop in to Bubión, and again what a delightful place this is. It is very hard to describe the complex network of tight lanes, little bridges supported by chestnut beams crossing streams, white cottages topped with kiln-like chimneys and jaw-dropping views. The architecture in all three villages is organic; the buildings all appear to have been hand-moulded out of clay. Another terrace was found, shaded by trees sporting all the colours of autumn in all its glory, and it is at times like that when everything in the world just seems right,and any possible stresses disappear along with the languid wisps of woodsmoke.